Background: The product registration in rest of the world is a challenging task because they are not harmonized. ASEAN and GCC regions come under semi-regulated market. These regions have somewhat harmonized their regulatory organization. The significance of an emerging market is increasing globally. It is important for pharmaceutical companies to be up-to-date with the latest regulatory development. ASEAN used ACTD format and GCC used ICH CTD format for drug product Registration. ASEAN includes a group of countries like Singapore, Philippines etc. Whereas GCC includes Bahrain, Kuwait, Oman, Qatar, Saudi Arabia and UAE. 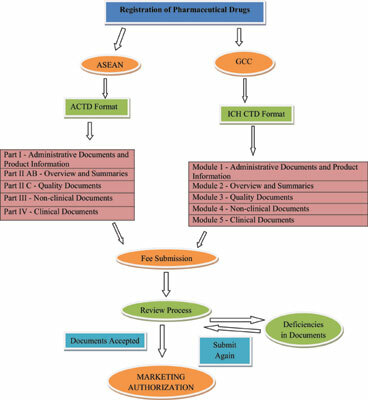 Conclusion: This review article focuses on general regulatory requirements of registration of pharmaceuticals in ASEAN and GCC region. Keywords: Regulation, ASEAN, GCC, pharmaceutical companies, drugs, guidelines. Keywords:Regulation, ASEAN, GCC, pharmaceutical companies, drugs, guidelines. Abstract:Background: The product registration in rest of the world is a challenging task because they are not harmonized. ASEAN and GCC regions come under semi-regulated market. These regions have somewhat harmonized their regulatory organization. The significance of an emerging market is increasing globally. It is important for pharmaceutical companies to be up-to-date with the latest regulatory development. ASEAN used ACTD format and GCC used ICH CTD format for drug product Registration. ASEAN includes a group of countries like Singapore, Philippines etc. Whereas GCC includes Bahrain, Kuwait, Oman, Qatar, Saudi Arabia and UAE.